My Card Attic: In With The Old . . . In With The New - NBUS Challenge. In With The Old . . . In With The New - NBUS Challenge. What is the meaning of this twist on an old adage? Well, when the old year 2014 left, it took with it my crafting mojo! Cue, in with the new, challenge . . . over at my dear blogging friend Darnell's wonderful blog. The challenge . . . to use something that you may have had a while and never used . . . hence, NBUS, Never Before Used Schtuff . . . ideal! The images were my NBUS supply, which was the beautiful, Altenew, 'Persian Motifs' stamp set, that I just had to get and then never got around to using it! The sentiment was a slightly newer NBUS, set, which is the, Simon Says Stamp, 'Friendship Messages' and the golden embossing powder was one of my most favourite embossing powders . . . no, make that my very most favourite of all time! That has been used a number of times! So, there you have it, Darnell has started my mojo back up again and kicked off my first post of 2015! Thanks as always Darnell, and thank you all, who popped in in 2014 and I hope to see you back here and around the various blogs during this year. As always, I appreciate all your coments and will reciprocate! Have a great day and year! Wow - this is truly stunning with all that gold glimmer and shine. If this is any indication of what your mojo will do in 2015, you've got a bright year ahead of you! Beautiful CAS card. Your NBUS stamp set is so pretty! Nice to see you on the NBUS challenge! Happy New Year! Thanks for sharing your gorgeous card and for your lovely comment on my card, too!!! 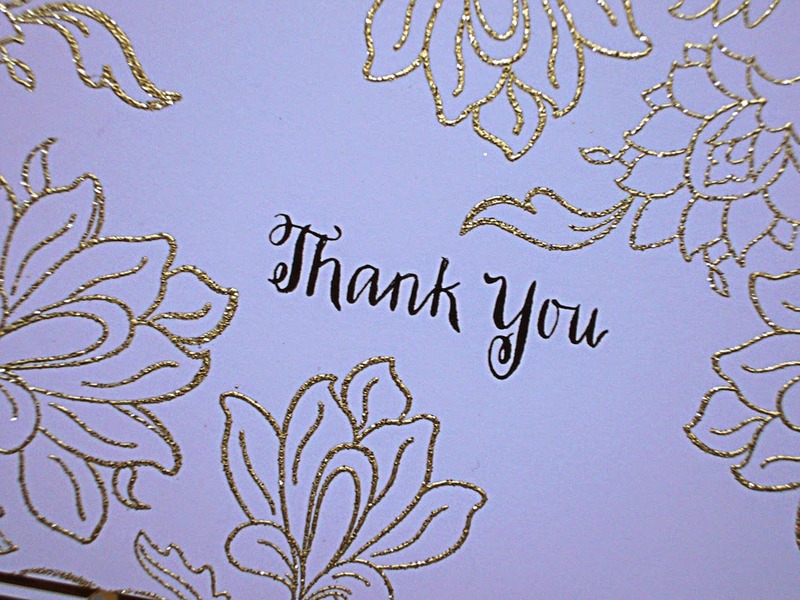 What a lovely CAS design for your pretty thank you card Hazel! love the gold embossing! 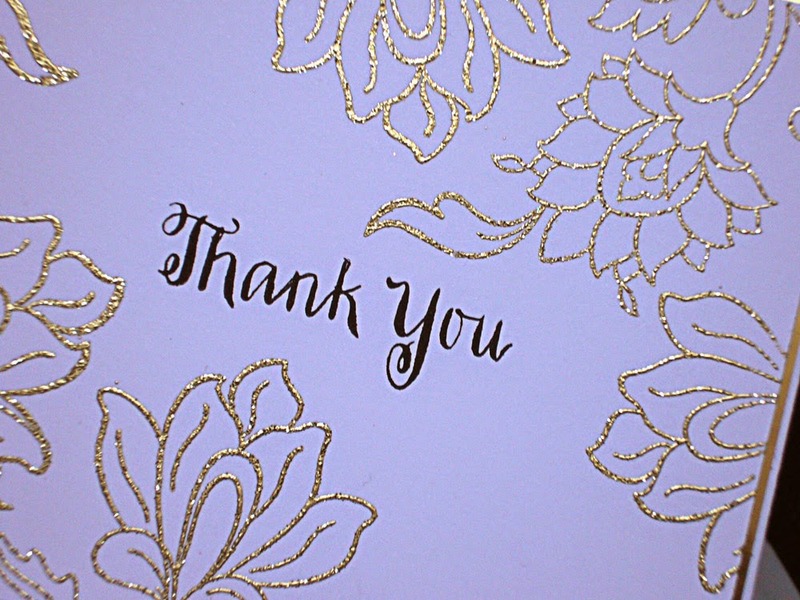 Stunning card...I love your gold flowers, so beautiful and what a fabulous way to say thank you. Yippie!! I'm so glad I got you in gear, Hazel! You have too much talent and are too inspirational to be in a slump for long! This design is everything I consider CASlicious! That stamp - just as it is in that fantastic design - would look gorgeous colored, too, I'll bet, or watercolored! Sigh, now I have more to add to my Wish Book, which will get piled on Mt. NBUS, and so the cycle continues, lol! Gorgerous card - how on earth have you managed to NOT use that beautiful stamp before! These embossed flowers look stunning in gold, and I love the lavender background too! 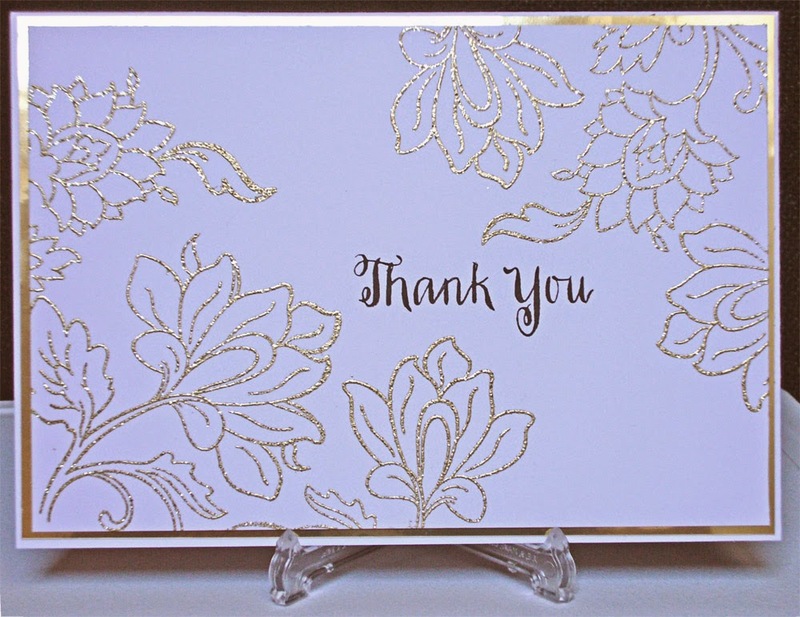 The gold mat adds an impressive touch of elegance to this thank-you card. I'm glad Darnell prompted you to pull this stamp set out and use it! NJ! This is GORGEOUS, Hazel! I've loved these flowers every time I've seen them but never as elegant as this embossing! Rich and elegant looking. The gold against the white is stunning! What a beautiful way to use this stamp! It's so satisfying to finally use our once "must-have" items that got put in a box somewhere, isn't it?